Anyone who runs compressed air equipment needs to control and treat the inevitably occurring condensate. This is what economic and technical reasons, as well as ever increasing legal regulations, demand. The separation of oil and water for dispersed condensates usually represents a cost saving and permanently reliable solution to the problem. 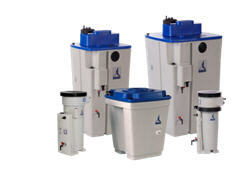 The purified water also meets the legal requirements regarding wastewater discharge. With many innovations and the respective know-how, BEKO’s redesigned QWIK-PURE® generation demonstrates the head start of an experienced producer.